Additionally, are you aware that most of the days of the week and months of the year of our current calendar are either named after a pagan god or an emperor of Rome? God never intended for us to be ruled by a calendar. Now, that doesn’t mean that I’m telling everyone to toss their calendars out, though sometimes I’d like to. Let’s take a look at how God, in His law, actually intended that our days, weeks, months and years were to be carried out. Let’s begin by the marking of a day. In creating the sun, moon and stars, God developed his system of marking time and also a system of providing signs and seasons in the heavens. A day and a night were to pass in order to count a day. When seven days passed, the final day, the Sabbath was to be the end of a week and was to be the day of rest. Be careful with this one, because it was not only a stumbling block to the Jews, but is also a stumbling block to many Christians and False Religions. Let’s continue forward before we deal with this, because it will be easier to see how this stumbling block affects us today. We’ve defined a day and a week, but how was a month to be counted? A month, which is obvious, was the full cycle of the moon from its first crescent to its final crescent. Pretty simple, right? Well, no exactly. This is where it becomes interesting. The first crescent might appear on the 29th day after the preceding one or it might appear on the 30th day after the preceding one. No one ever knew for sure. They had watchmen appointed to look for the appearance of the first crescent and it was so important that the sighting of the crescent had to be confirmed by a second witness who also saw it. Why was it so important? It was important, because the following morning after sighting the first crescent would be the first day of the week and the first day of the month. The Sabbath would then fall on the seventh day, the fourteenth day, the twenty-first day and the twenty eighth day. A year, was, obviously, twelve cycles of the moon. There wasn’t a set number of days to a year, just a set number of months. SO WHAT! Right? So, our calendar is way off from God’s calendar. What difference does that make? Only two really. The first difference is to destroy any idea that we, in the modern age, might have concerning our keeping of the Law of the Sabbath. Some want you to keep the law of the Sabbath on Sunday and others on Saturday, but the reality of the situation is that it is impossible for us to truly keep the Law of the Sabbath, because the true Sabbath, on God’s calendar could fall on any day of our modern week, because it would be based on the cycles of the moon, which often begin mid-week. The second difference is to point out that God has been, is and will always be in control of the cycles of the sun and moon. We take for granted that tomorrow will come in exactly the same way that it did today; more than likely it will, but if you consider that the first sliver of the moon comes when God determines it, then you have a picture of what God truly intended for us. In reality, just like with the people of Israel, our week, month and year begin and end as God determines. You see, God never intended to create the world and then just turn it loose to spin until time was up. Neither did He intend for us to be born, turned loose and allowed to live our days without His hand being right in the middle of the mix on a daily and weekly basis. The best example of this comes from Exodus 16. God not only wanted to test the faithfulness of the people of Israel, but He was also making it very clear to them that they would be provided for daily, if they would look toward God for their provision instead of trusting in themselves. We now live in an age where something far greater than manna is being provided for us daily, and yet, we continue to lean on our own understanding and trust in our own wisdom and strength for daily living. Jesus Christ is both the manna that feeds us and our Sabbath rest. He is the fulfillment of the law of the Sabbath as well as every other requirement given. Rather than finding any justification within ourselves, whether it is good things that we do or by keeping certain laws, we MUST find our justification in Christ and Christ alone. Brothers and Sisters, the days before us are rapidly becoming less in number and we need to be finding ourselves in Jesus Christ in every single one of them. Our days, our weeks, our months and our years need to be marked by the light of His glory that shines day and night. Therefore, look to that which builds up your faith and encourage those things in your families and friends. All things are lawful for me, but not all things are helpful; all things are lawful for me, but not all things edify. Let no one seek his own, but each one the other’s well-being. – 1 Corinthians 10:23 & 24. I'm interrupting my regularly scheduled posts with a special post that has been weighing heavily on my mind for several months. To the contemporaries of Jesus the words “no one knows the day and the hour,” had special significance to them. The first is related to the marriage traditions of Jesus’ day, which is extremely significant to Christians, due to the fact that we are the bride of Christ. The second is related to the Feast of Trumpets, which is the ultimate fulfillment of the Jewish Feasts which God commanded Israel to follow. Though the two events come in proximity, they are not the same where the fulfillment of the end of times is concerned. Let me explain each in turn. In the Jewish marriage custom, a man became betrothed or engaged to a woman and made a formal announcement of his intension to marry her. That’s not particularly different from what we typically do today, however, there is a difference in the planning and timing of the actual wedding ceremony. Returning to the rest of the parallel to the wedding, it is critical to understand that it is neither the bridegroom nor the bride who sets the day and hour of the wedding in Jewish custom, but the father. Basically, the father would inspect the addition on his house and make certain that it was ready before he gave his final approval. Once the father of the bridegroom gave his final approval, then the bridegroom would go out and blow his shofar (trumpet) and that would be the signal for the bride to come and meet him. I don’t think this is a literal number of 100,000,000 plus 10,000, but instead the best exaggeration of the numbers that John could see in his vision. Basically, there is a massive number of people and angels, which tells me that the saints have already been caught up to heaven. Now this scene takes place before the opening of the seven seals of judgment, which is to touch off the tribulation. There is another reason that I believe this to be true and that is because I believe that the prophesy of Daniel is specific to the people of Israel, thus the last week of years, the seventieth week, will apply only to the nation of Israel. Further discussion of this is not really necessary at this point, so, let’s shift gears for a moment and focus on Messiah and His fulfillment of the law of God where it relates to Israel. Though we celebrate Jesus’ birth in December, it is much more likely that he was born in the first week of spring; the first month (known as Nissan) and likely the first day of God’s calendar year, which is in the spring. Now, before you start arguing for traditional Christmas, which was actually connected to pagan celebrations around the winter solstice by the Catholic Church, let’s look at several factors. The first and, to me, the most telling one is the fact that there were “shepherds out in the fields keeping watch over their flocks by night.” – Luke 2:8. This is something they would not be doing in the middle of winter when the flocks were shut up in the stables at night. Those of you who are familiar with lambing and calving season will probably understand this better than most. 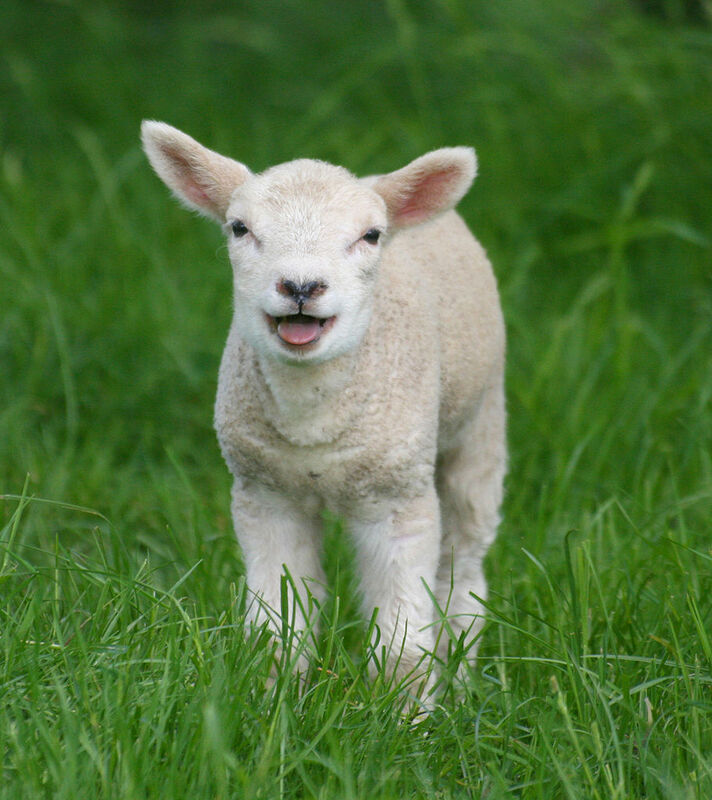 It was the time for lambing, which took place in the spring time, just like it does today. When this time comes, today’s ranchers, just like their ancient counterparts watch over their flocks and herds diligently, day and night. I know this, because I used to do this on my father’s ranch in Colorado. Now, if you draw the parallel of Jesus being “the lamb of God,” this begins to make even more sense, however, that’s only the beginning. There are four more, very significant, parallels to this which coincide with aspects of the spring feasts which God commanded Israel to keep in Leviticus 24. When you read the gospels, it is very obvious that Jesus' death, resurrection and ascension all took place in the time frame of the spring feasts that were laid out in Leviticus 23. Those are the first three of seven: Passover, Unleavened Bread and First Fruits. The next on the calendar occurs 50 days to the day after the seventh Sabbath of the year. That feast is the Feast of Weeks, which coincides, precisely, with the day of Pentecost, when the Holy Spirit first came upon the church. I think that it is pretty easy to draw a parallel that the last, nearly 2000 years, we have been in the growing season and awaiting the time of the harvest. It’s not hard to connect that Jesus’ fulfillment of the last three feasts of God’s year which come in the fall: the Feast of Trumpets, the Day of Atonement and the Feast of Tabernacles. Essentially, Jesus’ fulfillment of the final three feasts with judgment, atonement and dwelling or tabernacling (or dwelling) with God will follow on the heels of that trumpet call. Reread Matthew 24 through the filter of what I’ve just shared with you, because it helps bring a better sense of order to both Daniel and John’s prophesies. Allow me to toss out a few indicators that the time for both of those trumpet calls, whenever they occur, is drawing very near. The first, actually, comes from the 24th Chapter of Matthew that we have already been examining. Summer would be the season when the fig tree blossoms and begins to bear fruit for the coming harvest, right? It would follow along perfectly after the Feast of Weeks, when the first fruits of the early harvest were gathered in. Think of your summer garden as you reflect on this. Understanding that the fig tree is symbolic of the nation of Israel, there ought to be little mystery to believers when they read this passage. The fig tree was restored in 1948, which is certainly significant. “This generation, which sees the restoration of the fig tree (paraphrasing), will not pass before all things take place.” Just using Israeli Prime Minister Netanyahu as an example, who was born in 1949 in Tel Aviv and fought in the Six Days War in 1965, which recouped all of the land that God had promised to Abraham, we begin to see how very near the final day of the Lord is. Netanyahu is symbolic of that generation who came at the same time that the fig tree was restored. One can certainly argue that these things have existed throughout the intervening time since these words were written, however, in the past 30 to 50 years, we have seen a steady rise in the acceptance of the attitudes that Paul warns Timothy about. Television, movies, music and literature have steadily pushed back the boundaries of the accepted norms of morality to the point that those vices that are listed above, to mainstream society, really are thought to be bad or evil, but acceptable and cherished behaviors. Whether you believe the rapture will come before the tribulation, during the tribulation or after, one thing is entirely certain, the cares of life and those things that weigh us down, are about to become of much less importance than we have previously given them. Why are God’s people hiding in a hole? Why are God’s people trying so hard not to stand out? Our churches today tend to try to blend in with the community around them so that they aren’t noticed. Blending in is okay to an extent, but not whenever it comes to either watering down the truth or disregarding it altogether. God found Gideon hiding in a hole to thresh his wheat. He wasn’t exactly hero material and yet, God knows our hearts when He calls us. To be fair, we have to understand that God’s judgment had come upon Israel and He had allowed the Midianites to prevail over Israel as a means of punishment. If you’ve read the story of Gideon, you know that he went on to test whether what God was asking him to do was real or not by putting out fleeces each night and they were either dry or wet in contrast to the ground around them. Gideon then put together an army, reducing it over and over again until it was down to only 300 men. God directed him to divide the men into three companies and he gave each of them a trumpet, a torch and a clay pot. Gideon’s army surrounded the camp while they were sleeping. 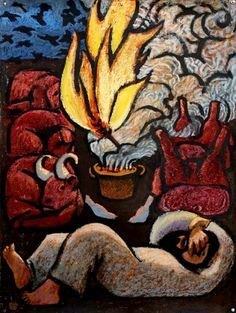 At the command, they blew their trumpets, called out “the sword of the Lord and of Gideon,” and then broke the clay pots so that the torches lit up the night. In the confusion of sleep, the Midianites slew each other. God’s power can bring victory in some of the craziest ways, simply because God isn’t limited by the same things that limit us. At this point I want to turn back to the questions with which I opened this post. Why are God’s people hiding in a hole? Why are God’s people trying so hard not to stand out? A few weeks ago, I was struck by how shallow those carrying the label of Christian have become when I observed a discussion concerning whether or not it was okay for Christians to take part in Halloween celebrations. The discussion mostly focused around two issues, those opposed to it and those who were justifying their participation through freedom in Christ. What does that have to do with Gideon? A great deal actually, if you consider how Gideon destroying the altar of Baal upset the community around him. After all, that altar wasn’t hurting anybody. Those who were true Israelites still knew the law of God and they didn’t participate in the spiritual worship of Baal, they just went and hung out for the fun and community fellowship. What did it hurt anyway? In most instances, one could argue that Halloween is harmless fun. I think that the real reason that some Christians try to justify participating in such celebrations is because they want to blend in and not be ridiculed by others in the community. However, I think that we are directed to something more important than entertaining ourselves or those in our community. We must understand two things and do two things. We are called to tear down the altars of Baal and we are called to drive the Midianites out of our land. To do that, I believe that we need to understand two things and then do two things. First we must understand that “we are mighty men and women of valor” who have the Lord with us. Second, we must understand that the things of this world have little value to us and have no power over us; “let them plead for themselves.” Once we understand these two things, what must we do in response to them? First, like Gideon, we need to test things against the word of God. I’m not proposing laying out fleeces, literally, but I am proposing that we take God’s word and use it as a guide for discerning what things are good and edifying and what things are destructive to our growth and the growth of those around us. Live today and everyday as mighty men and women of valor, trusting in the strength and power of our Lord, even when it goes against whatever those around you seem to think is right and even if what you’re directed to do seems crazy. The sickness of self-determination or self-justification reaches well beyond our modern times, but is an epidemic in our day. Please don’t misunderstand me. I believe that a person ought to give every bit of energy and talent that they possess to any endeavor. In many ways, hard work cleanses the soul and keeps us from most sins, however, it is the attitude of “I did it my way,” which becomes our downfall. After God had delivered the Israelites out of Egypt, He brought them to the Promised Land. Numbers 14 gives the account of what happened the first time that they arrived in order to take possession of the land. All but two of the spies were terrified of entering into the land because, they reported, it was a land of giants and they believed that they would surely be destroyed by them. It was because of their rebellion and their refusal to trust in God, even after having seen how He had delivered them out of Egypt, that caused God to turn them back into the wilderness where they were to wander for forty years. Though God refused to allow that generation to enter the land, He remained faithful to His promise and after the forty years had passed, he brought them back for another try. One of those two spies who had not been afraid of possessing the land was Joshua, who was later given command over Israel. You know the story related in Joshua, chapter 6. Consider how foolish this must have appeared to those who watched each day from atop the walls of Jericho. There is no doubt that as each of the six days passed, there was a great deal of taunting and ridicule taking place from atop the walls. No doubt, even within the ranks of those who marched, there was some reservations about whether what they were doing was actually going to deliver the city of Jericho into their hands. After all, how was marching around the city and blowing on trumpets going to win a battle? Their mothers and fathers had witnessed how God had led them out of Egypt, some of those who marched around the wall might have been very small when that happened, but many of them would have never seen the mighty hand of God at work, though, of course, that hand fed them every day while they were in the wilderness. We’ll look at that story another time. However, they obediently carried out the order that had been given. The result? I’m about to step on some toes, but rest assured that my own are being mashed right along with yours. The problem with Christians today is not that we don’t have a lack of fun and joy in Christ, but we do lack a sense of the battle that we are facing. We lack an understanding of the fact that the power of the Holy Spirit to defeat the sin in our lives is readily available. We lack an understanding of the fact that through the power of the Jesus Christ, the gates of hell cannot stand against us. We lack focus for the battle. We lack ferocity for defending God’s Word. We lack diligence and discipline for gearing up for battle and stepping forward with the confidence to engage the enemy. We have no problem focusing on the love and freedom that are found in Christ, but run away to hide from the sharp cutting truth of the other attributes that He asks of us: holiness, righteousness and discernment of truth. We tend to seek self-justification by appealing to Jesus’ attributes of love, but tend not to appeal quite so eagerly to His calls to repentance and turning away from error. We have no problem when it comes to searching for ways to justify ourselves through the scriptures whenever we want to do things that tend to fall in those “grey areas”, but we’re hard pressed to grasp the concept that GOD is in command. Consequently, we tend to be more like the first generation of the Israelites who see the giants in the land, rather than those who were fed by the manna from heaven for forty years. The time is very near when the frivolous things into which we put our greatest efforts will stand in very pale comparison against glorying in Christ and depending upon Him to provide the courage and strength to put one foot in front of the other, to stand, to crawl or to even lift up our heads. When that day is upon us and we are being tested to our very limits, where then will the concerns of today be? Upon whose power will we rely? To the world around us, our faith is foolishness and we are not only going to be ridiculed for it, but we are likely going to lose our freedom, perhaps even our lives for defending it. Therefore, it is time that we answer with full faith the challenge which Joshua issued to the Israelites in Joshua 24. 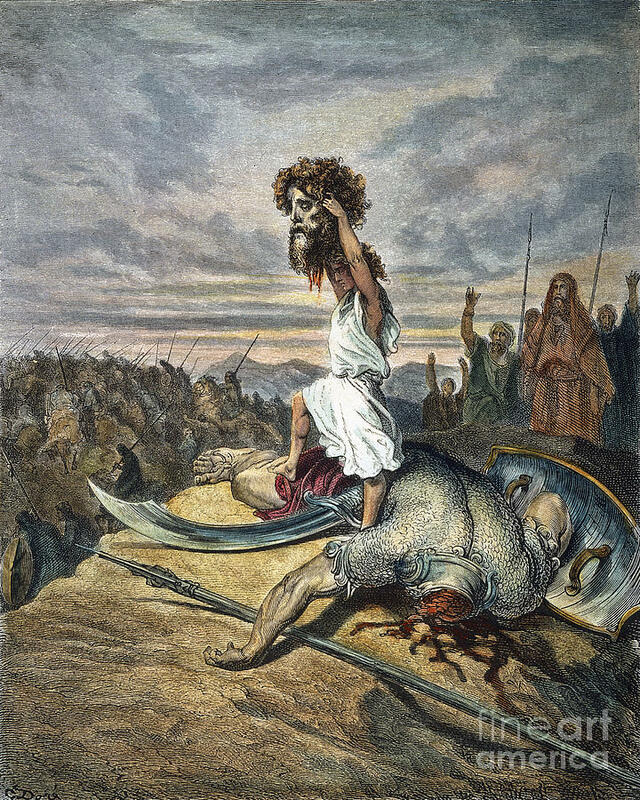 Goliath had laid out his challenge to the armies of Israel. He’d stepped forward and taunted the army of God, making light of the fact that no one among the Israelites had the courage to step forward and face him. You’ve heard the story. It is even used as a metaphor for how the “little guy” or the “underdog” is able to take down the giant. Though this scene has lived through the ages and is common in every household, what’s really behind the story? This scrawny, smart-mouthed kid who just came in off the ranch to bring his brothers some food and to find out what’s going on for the old man has no experience at making war. He hasn’t gone through any formal training. He doesn’t even have any armor. This boy, of whom God boasts, is a man after His own heart is completely ill equipped and unprepared to do battle with anyone, let alone Goliath. David, however, has something much more important. 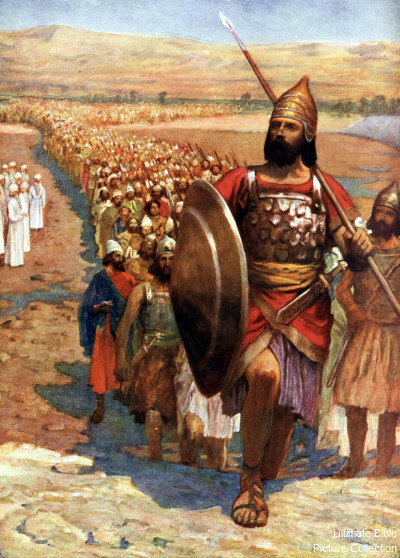 David was incensed that anyone would challenge the army of God in that way. He saw the challenge as being against God Himself and he had no intention of letting Goliath get away with that. Notice, however, that he didn’t say, “I’ll go out there and do my best and maybe I’ll get in a lucky shot.” He was absolutely confident that God had his back. Remember that God had already ordered Samuel to secretly anoint David as the next King of Israel back in 1 Samuel 16 when God had had it with Saul. “Now he was ruddy, with bright eyes, and good-looking. And the Lord said, ‘Arise, anoint him; for this is the one!’ Then Samuel took the horn of oil and anointed him in the midst of his brothers; and the Spirit of the Lord came upon David from that day forward.” 1 Samuel 16:12 & 13. When the Spirit of the Lord comes upon you, you ought not to have fear of anything. David had no idea that God had sent him to the Valley of Elah for a special purpose that day. He was just doing as his father, Jesse, had asked him to do and was minding his own business, but his hackles stood up whenever he heard Goliath defying God. Folks, I get like this when I hear people, organizations, government leaders and enemies defying God too. Some of you do as well. But before we step into battle, we have to know where our true strength is coming from. Watch what Saul and his servants tried to do to prepare David for battle. What men think is appropriate for taking on a great battle is often times an encumbrance to serving God’s purpose. Saul was a big dude. He wasn’t Goliath size, but he certainly dwarfed David, so putting his armor on David really had the effect of just weighing him down and making him awkward. He probably even looked silly when he tried to walk in it. David had bourn their fussing over him with patience, but when it came right down to it, he knew that he couldn’t wear that armor. David took his staff and his sling and stopped at the brook to pick out five smooth stones. Why select five stones? The number of stones, as far as I know, wasn’t significant other than it wasn’t one stone. By picking up five stones, David was committing himself to a battle. He didn’t have the mind-set that he might only get one shot and he had no idea how the battle was going to play out, but he was ready for a drawn-out affair. He got his five stones and headed out to face Goliath. When Goliath saw David he was insulted. The boy was hardly worthy of doing battle with someone as great as he was. He said, in paraphrase, “You are coming to me with a stick like I’m a dog? Fine, bring it on, I’ll feed your carcass to the buzzards and the coyotes.” David’s response tells us that David’s commitment was a Godly one. Then David said to the Philistine, “You come to me with a sword, with a spear, and with a javelin. But I come to you in the name of the Lord of hosts, the God of the armies of Israel, whom you have defied. This day the Lord will deliver you into my hand, and I will strike you and take your head from you. And this day I will give the carcasses of the camp of the Philistines to the birds of the air and the wild beasts of the earth, that all the earth may know that there is a God in Israel. Then all this assembly shall know that the Lord does not save with sword and spear; for the battle is the Lord’s, and He will give you into our hands.” – 1 Samuel 17:45-47. You know how the story plays out. This is the coming out of Israel’s second greatest king. He had his ups and downs, however, David was God’s chosen one and it was from his lineage that He sent His greatest king. But David wasn’t boasting in his own skill with a slingshot, I don’t think anyone can boast in their skill with a sling shot. In my experience, one shot out of five, had David had to use all five stones, would have been a pretty good fete. David’s boast was in the Lord. I have purposely laid out this series of blog posts beginning with the power and preeminence of Jesus Christ, because I want everyone who reads these words to understand that my own confidence and my own boasting is not in myself, but in Jesus Christ. I have little more than an inaccurate slingshot. I have no credentials with which to impress and I have no particularly profound wisdom. I’m nothing more than a man who grew up on a ranch out in the mountains of Colorado. However, I, like David “ain’t afeared of nothin’,” because my courage, confidence and commitment aren’t to the things of the world, but come from the Spirit of the Living God, even in the Lamb of God who was slain. Those who know Christ and have His Holy Spirit living in them have that same power and more if they will call upon it. As days of great testing and trouble come upon Christians; are already upon many, remember in whose army we really fight. Put your confidence in the Lord. Make your commitment to the Lord. Be found courageous in the Lord when your day of battle approaches. Some of my greatest inspirations come from dreams. I will typically awaken from a dream or have a thought enter my head as the first thought of the day. After my morning study period, they either take root or get discarded. The idea to begin writing this blog has taken root several times and began in several stages, but let me tell you of two of the most decisive ones that truly got a hold of me. Please understand that I don’t believe that these are great visions with any meaning to anyone outside of the Lord working inside of me, so please don’t read anything into these. I have awakened on several occasions with the image of a mother wolf, a mother bear or a mother lion in my dream right before awakening. Two of these, the wolf and the bear, are images that have been used to describe parts of my nature, I even wrote a novel called MacGregor’s Wolf: Lessons of Time, which is, in many ways, an allegory of my struggles. So, these images were there to specifically communicate to me something of my nature. I am a warrior. It has always been a part of my personality and who I am. I was made without fear, or at least a lessoned sense of fear. Needless to say, when not kept in check, my fearlessness has gotten me into to trouble and caused a lot of problems in my life. Seeing the images of those animals, who are known for their ferocity in my dreams, initially, made me even bolder and more eager for the fight. What I discovered, however, was that I was beginning to cast pearls before swine. What do I mean by that? Basically, I was attacking and enjoining battles that were a waste of my time and energy. Those battles were not only leaving me weary, but they were making me walk away harboring anger. That anger would lead me to rebellion and hardness. And then God started to open something up to me through His word, which began to bring me back under control again. Scripture also tells us that "we do not wrestle against flesh and blood, but against principalities, against powers, against the rulers of the darkness of this age, against spiritual hosts of wickedness in the heavenly places." – Ephesians 6:12. In the context of this passage, we are told to put on the full armor of God in order to engage in this heavenly battle. We begin with knowing that the power to be the warrior that God wants us to be can only be found in the Lamb of God. Moving forward for the next several weeks, we are going to have a look at the great warriors of the Old Testament, not as Sunday School Bible Stories, but in order to examine where the true power for those warriors to do battle had come from, how they allowed themselves to be used and, in some cases, how they failed to use the power given to them to do the Lord’s work. It is my sincere hope that these posts will strengthen us toward the great work that lies ahead and help us to focus our battle in the right direction and for the right reasons. I’ve been establishing the Holiness of the Lamb of God, His power and preeminence, so how does the smoking oven and the burning torch from Genesis 15 have anything to do with that topic? Because it is an image of God’s faithful commitment to His promises that cannot be overlooked. It establishes, in a powerful way that Jesus Christ is the author and finisher of our faith. There are plenty of lessons to be learned from this passage, but an entire book would be required to contain them, for the moment, I want to focus on just one part. As I already mentioned the parties of the covenant would pass between the two halves making a promise to keep their end of the deal. I have no doubt that Abraham was expecting God to come to him and walk between the two halves along with him, because he spent the entire day chasing off the buzzards who were trying to get at the carcasses. However, God did something very different, which is not uncommon when dealing with God. Instead of coming and walking between the halves with Abraham, God came in a symbolic way and passed between those two halves alone. He came as a smoking oven and a burning torch. The representation of Himself in that way is a representation of the divine trinity. God the father is represented in the oven or kiln from which all things were created and all provisions are given, the smoke is a representation of His Holy Spirit and the burning torch is a representation of the Light of the World or Jesus Christ, the son. The more important representation here, however, is the fact that ONLY God passed between the two halves. By passing through the two halves alone, God is communicating to Abraham and even to you and I that regardless of whether or not we keep our end of the deal, He is going to provide the promises of the covenant. In other words, He will not only make the covenant, but He will also fulfill it, which is precisely what He has done through Jesus Christ and the Holy Spirit. In this promise, God is clearly establishing that HE will fulfill it, that HE will make that change in us. We won’t do it, we can’t do it and we have no power to do it. Therefore, God is going to do it for us. There is really no greater assurance for a Christian than this. It isn’t dependent upon us to fulfill this promise. Paul points this out in numerous places throughout his letters. “For by grace you have been saved through faith, and that not of yourselves; it is the gift of God, not of works, lest anyone should boast.” – Ephesians 2:8 & 9. “…He who has begun a good work in you will complete it until the day of Jesus Christ…” – Philippians 1:6. “… looking unto Jesus, the author and finisher of our faith, who for the joy that was set before Him endured the cross, despising the shame, and has sat down at the right hand of the throne of God.” – Hebrews 12:2. Over and over and over, throughout the scriptures, God has been calling His people to surrender themselves to allowing Him to be the author and finisher of the covenant. God has been trying to get us to stop believing that we have the power to save ourselves. God has been trying to get us to understand that He has provided all things for us, even to the point of sending His own son to be the ultimate sacrificial lamb in order to fulfill His covenant; even Jesus Christ. We can have no boasting or glorying in ourselves for our salvation. We cannot rob God of this particular glory and this miracle of rebirth. It is His great work and His alone and I dare say that we will not witness the full power of that great work until we allow ourselves to let go of our own part in it and recognize that God not only made the promise, but also fulfilled it, even in our own lives. Are Tolerance and Love the Same Thing? I started this blog promising to lift the fleece on the wolves, the false teachers and those that make Jesus Christ out to be something that He is not or to weaken His authority. In the previous two posts, I have been establishing His power and authority. In this post we want to look at how our command to love one another has become the source of a great deal of confusion. Did Christ command us to love one another? He certainly did, but we cannot lose focus of the first priority of His love, which is to bring about our restoration with God and can only be done through confessing our sins and being forgiven and justified through Jesus Christ. We discussed this in the first two blogs to an extent, by pointing out that Jesus was resolutely focused on His purpose. Let’s dig a little bit deeper. This is really a two sided coin that is caused by our failure as believers to keep our own selves in order and a misunderstanding of what it means to love one another. The church and believers are often under attack because our message often enters into a grey area. At times, when condemning sin, it sounds as if the church and believers are being hateful. At times, those observations from people outside the church and the family of believers are totally justified. When we are frustrated, afraid, angry, confused, overwhelmed, etc., we often allow those emotions to guide us toward an “unrighteous” form of hatred. Don’t be confused, we are to have a “righteous” hatred of sin. When that hatred spills over into judgment of another person and hatred of another person, that’s when we cross the line into “unrighteous” hatred. When we don’t clean up our own act first, we invite that sort of hatred to spill over into what we say and how we say it, either face to face or on Facebook. 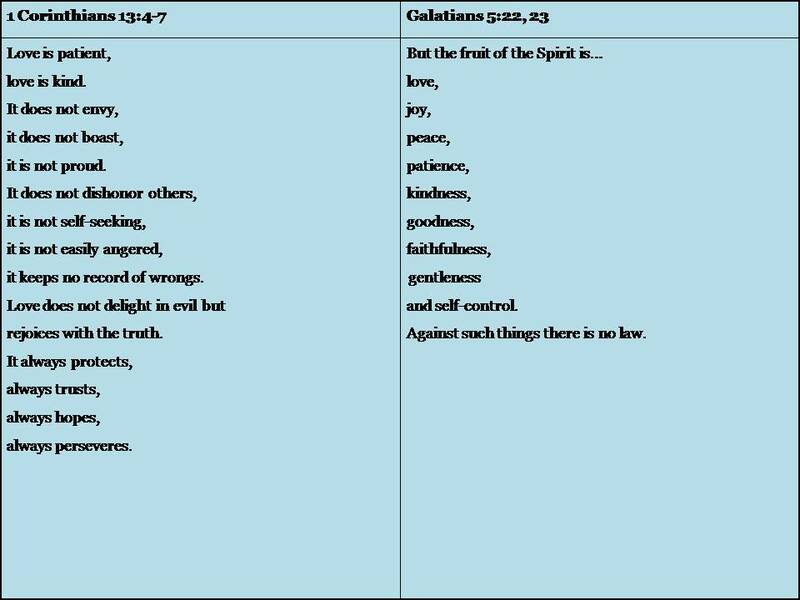 One of the fruits of the spirit, which is also a very strong part of speaking the truth with love, is self-control. In our vigorous condemnation of sin, we cannot lose sight of the fact that, we too, are sinners and desperately in need of the same salvation that is offered by our savior as anyone else. Let’s sidetrack for a moment in order to get a better picture of our position in the faith by comparing two passages of scripture that make up essential attitudes of our faith. Take a moment to study these two passages of scripture side by side. In essence, I think you will find that walking in love and walking in the spirit are very close to the same thing. If we are to truly have our houses clean and in order, we must follow Christ in this way. To rejoice in the truth we must not only believe in the truth, but speak it as well. In addition, we must protect the Law of God and the Gospel from being watered down, misrepresented or perverted. We cannot wink at sin, we cannot tolerate it and we cannot turn a blind eye toward it and still truly love others. At the same time, look at the list of “nots:” envy, boast, proud, dishonor others, self-seeking, easily angered or keep record of wrongs. Let me make a suggestion here. Speaking the truth with love, means declaring the Gospel, while walking according to the fruit of the spirit. The confusion that seems to follow the church and believers comes from a mixed message that the church and believers haven’t clarified well. Speaking the truth, rejoicing in God’s law and the Gospel of Jesus Christ and loving our neighbors does not include tolerance of sin and acceptance of it. On the other hand, it also does not include the angry, dishonoring judgment of those who sin. “Judge not, that you be not judged. For with what judgment you judge, you will be judged; and with the measure you use, it will be measured back to you.” – Matthew 7:1 & 2. When confronting the sins of the Pharisees in order to correct their perversions of God’s law, Jesus wasn’t often as gentle and meek as we often think of Him. On a few occasions, he was downright vicious (Matt. 23, Luke 11 or John 8 after forgiving the woman caught in adultery), but on other occasions, like when he spoke to Nicodemus (John 3), he was gentle. We looked at one of these in the previous post when Jesus declared who He was, “before Abraham was I AM.” Note that on every occasion, he was in control and he stayed on topic. His attack was upon the sin that was being committed and in every instance and He always called for repentance. “And although we’ve been called to confront the world, we need to do it in a godly way. We’re not to proudly parade our purity by arrogantly confronting the lost world with our spiritual supremacy. God did not rescue us from our spiritual darkness so we could live like the Pharisees. “In the constant conflict with the world, humility is paramount. We need to always remember that the world opposes us not because of our own inherent goodness or our spiritual savvy. As John MacArthur explains, the world hates us because of Christ.” – Inviting Persecution. Here is one last bit of scripture to help focus yourself on speaking the truth with love and being that sweet aroma to those being saved, but the stench of death for those who are perishing. Those who believe that Jesus was always meek and tolerant, Politically Correct, if you will, need to look no further than the eighth chapter of John in order to see a completely different side to the Son of God. If you take into account who Jesus is and what His primary mission is and was, as was discussed in the previous post, however, it isn’t that hard to get a handle on the fact that Jesus Christ is the one and only WORTHY heir to the kingdom of God; not just the worthy heir who came along about two thousand years ago, teaching and doing a few scattered miracles, but the heir who has been present since the beginning of time. Throughout the book of Revelation, this sentence is repeated over and over again. Do you think that it might be important? Jesus wanted John to clearly understand that all that he was witnessing in his vision had been something that He, Jesus, had been a part of since the beginning. 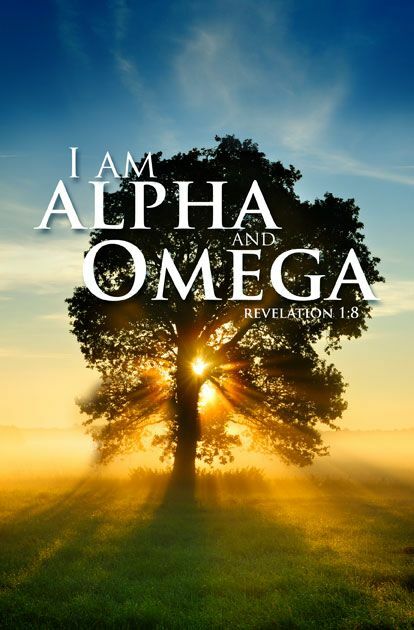 By the way, those of you whose Greek is a little sketchy, Alpha and Omega is like the phrase that English speakers use to say, “from A to Z.” Jesus doesn’t end by saying that he is the Alpha and Omega, He wants it to be very clear that He is “the Beginning and the End,” both capitalized. He is not “a beginning and an end,” He is THE, the ONLY one or, shall we say the “superior” or “preeminent” one. If that explanation hadn’t been enough, our Lord goes one step further and spells it out pretty clearly “who is and who was and who is to come, the Almighty.” It baffles me how after those three phrases linked together in a single statement anyone can deny the fact that Jesus Christ was with God from the beginning of time. The disciple John even testifies to this fact about Christ. Why am I harping on this, you might say? I am harping on this because it speaks directly to the power of Jesus Christ. He is present within creation from the beginning as the powerful means by which everything was created. How does John refer to Jesus Christ? He refers to Him as the very power of God’s creation. Is that strong enough for you? Jesus wasn’t just a great teacher who walked around doing good works, being sweet to everybody, tolerating everything and singing Kumbaya. He was God, who became man in order to dwell among us so that He might be the One Worthy Lamb who would fulfill the law of God and undo the curse of sin and death that was brought upon mankind when Adam failed in the very beginning of human existence. He is the “Author and Finisher of our faith, who for the joy that was set before Him endured the cross, despising the shame, and has sat down at the right hand of the throne of God,” as Hebrews 12:2 puts it. So, how did I connect that Jesus was the power of God in creation? Very simple, consider how God created. What is the phrase right before every single act of creation? “And God said…” In other words, God spoke and things came into being. When John calls Jesus the Word, again uppercase (even as it is translated from the original writing), he is referring to the fact that He was the very power of God in creation. Jesus, Himself, testified to that very same thing in one of the most profound declarations of His power in the eighth chapter of John, which is what was used to open this post. Then Moses said to God, “Indeed, when I come to the children of Israel and say to them, ‘The God of your fathers has sent me to you,’ and they say to me, ‘What is His name?’ what shall I say to them?”And God said to Moses, “I AM WHO I AM.” And He said, “Thus you shall say to the children of Israel, ‘I AM has sent me to you.’” – Exodus 3:13 & 14. Before we go any further, look back at the phrase in Revelation… “Who is and who was and who is to come.” It’s the same verb, “to be”; a verb that communicates existence. The significance of I AM, however goes well beyond that, especially when Jesus declares Himself to be I AM, because that is the name of God, Yahweh, that was forbidden to be spoken by the Jews. As a Jew, you could refer to God using any number of His names, but you were never to use the name Yahweh, which directly translated into I AM. Is there any wonder that Christians, true Christians, are so often attacked for speaking the truth? The truth is not comfy and cozy. The truth requires that people understand that Jesus Christ is preeminent over EVERYTHING, because HE IS! Where do you think the power to be able to heal the sick, the lame, deaf, the mute, the blind and even the dead came from? Who else can fix something better and more efficiently than the ONE WHO MADE IT to begin with? The same One; the same I AM, the same Alpha and Omega, the same Beginning and End who has the power to forgive sins, conquer death and is THE ONLY ONE WORTHY to open the scroll that lays out His inheritance, as we examined in the previous post. Friends, why do we cower in fear when it comes to speaking the truth? We are joint heir, even brothers to the GREAT I AM. I submit to you that we will have that truth tested, heavily tested over the next several years. We are not going to be Politically Correct. You can already see it coming. You can already see the attacks that have come toward Christians. I have felt their sting for just trying to speak the truth concerning how God views homosexuality and abortion over and over again. From what authority do I speak? How dare I go contrary to the accepted principles of the day, after all, Jesus told us to love everybody and accept everybody as they are. I must be some right-wing religious nutcase, because anyone who really believed in the teachings of Jesus would never condemn those things. I’m sure that whenever you’ve stood up and declared the truth, you’ve heard similar things. We’ll move on to a discussion of Jesus’ teachings of love in the next post; something that I touched on in my book A Christian Response to Troubled Times. However, before we leave this one, I want to drop just one more bit of scripture on you. This one coming out of Revelation 22:13, the end of the Book.